NVIDIA’s Tegra chips were pretty popular with the developer-on-a-budget crowd and I had personally seen many of my friends use Tegra kits in their projects while in university. Looks like NVIDIA wanted to roll out a much-needed upgrade to the same amateur-robotics-application market (is there even a name for this segment?) 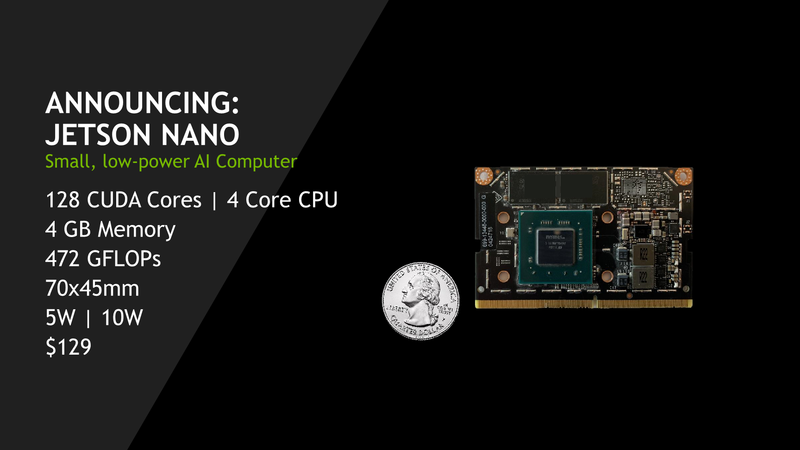 with the Jetson Nano – a $99 tiny processor that packs a punch worth half a teraflops. 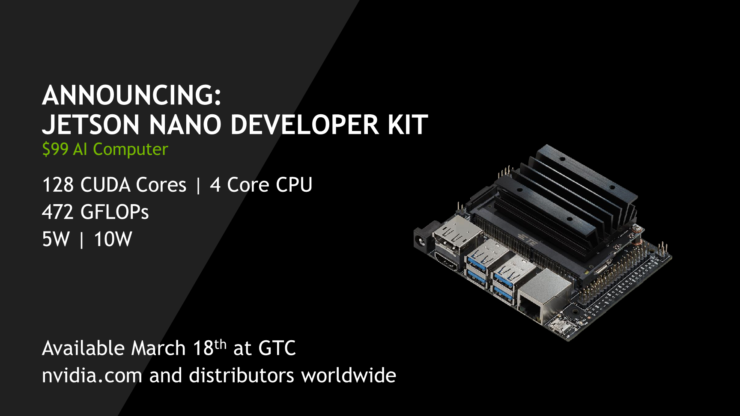 The NVIDIA Jetson Nano is a cute little package that packs 128 Maxwell cores (hello mature nodes!) capable of delivering around 472 GFLOPs of FP16 compute – which is the go-to workload for AI. The Package will consume only 10Watts of power at peak and packs a 4-Core processor based on the ARM A57 architecture as well. The system has 4GB of LPDDR4 memory as well as 16GB of eMMC space. Hardware-level video encode and decode is supported up to 4K 60 and here’s the kicker: HEVC is fully supported – which is going to work wonders in that small space of only 16GB. 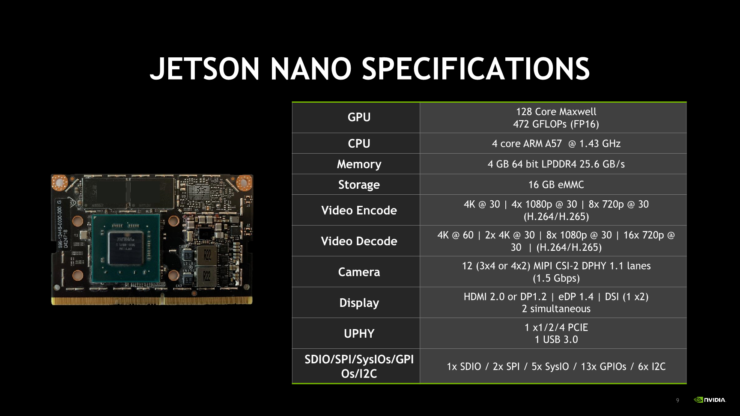 The NVIDIA Jetson Nano is capable of 12 MIPI cameras across 3×4 or 4×2 lanes and supports a display output of HDMI 2.0 or DPI 1.2. IOs include a USB 3.0 and even a PCIe port capable of supporting up to x4. Dev ports include 1x SDO, 2x SPI, 5x SysIO, 13x GPios and 6x 12C. The Jetson will retail for an MSRP of just $99 making it an excellent choice for students that want to give their creation a brain and a vastly superior option to raspberry pie in almost every way. 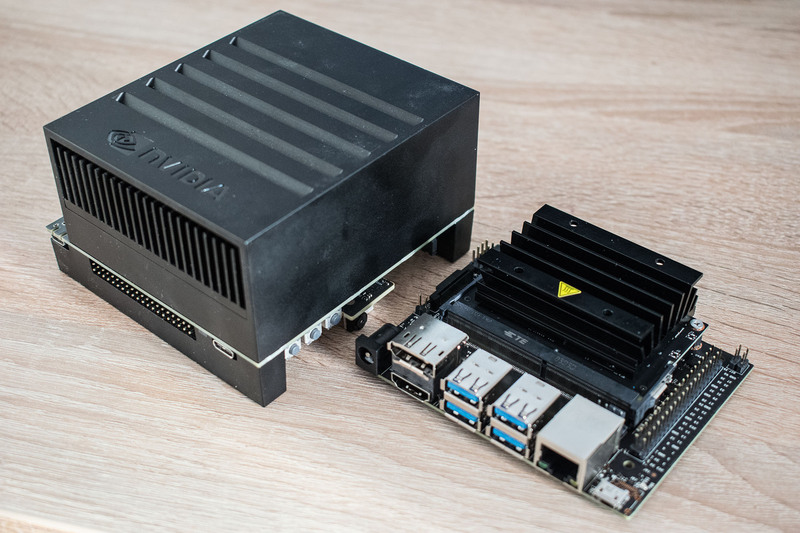 The company didn’t support at the hardware level either because this tiny thing supports CUDA-X, which is the company’s latest implementation of their proprietary (but very deep) dev environment.